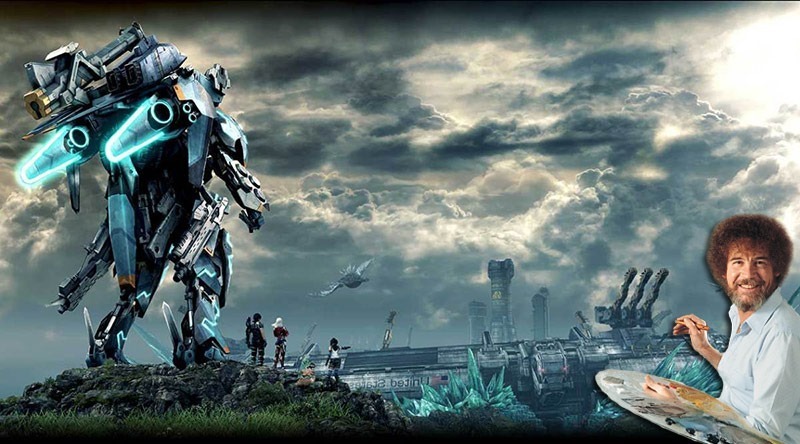 Xenoblade Chronicles X is out in Japan in April this year, and most likely much later for the rest of the world. It looks like a massive game, and something that will have plenty of folks dusting off their Wii Us. It’s also got a massive combat system, that is all about position, Arts and staying loyal to your favourite monster-hunting corporation. Simple enough here. Spot a target, draw your sword and start hacking away. You’ll have access to swords and daggers for up close and personal combat, and some proper firepower for ranged attacks. You’ll need to switch between the two, in order to maximise damage. AKA special abilities, Arts can be seen at the bottom of the screen, and are divided up into Fighting, Shooting, Recovering and Weakening Arts. In combat, you’ll need to chat to your allies in order to have your Arts fire up and present themselves as a viable solution to killing the beast that wants to turn your skull into a marital aid. By activating the highlighted Art, you’ll also trigger Soul Voice, which buffs your Art up, as well as restores HP to your party. Attack Arts + Attack Arts – A combo attack with greater effect, that can be used as part of a string from a Fighting Art or a Shooting Art move. Collapse + Tumble – If you can make an enemy collapse with an Art and then tumble that enemy with another Art, you’ll lock them into a state where they receive 1.5 times damage. You’ll need to take advantage of the terrain in order to flank your enemies and attack their weak points. Said enemies will have various weak points which can be targeted and destroyed, which also rewards players with parts that cannot normally be obtained. Arts do require cooldown periods. But if you use an auto-attack after an Art has been cast, the ability will refill and enter a Double Recast state which will allow you to cast it with a greater effect than what is normally allowed. Accumulated during auto-attacks, enough Tension will allow you to revive a fallen ally. If Overclocking Gear is activated, players can find their cooldowns for Arts greatly shortened, as well as the chance to use Triple Recast. This movie is also more effective when activated in conjunction with your allies, which results in greater effects. Pretty much what you expect. Enemies will be indicated on screen, and can be triggered into attacking you if you get too close or make a racket. Weapon and armour sets have their own attributes, while players can equip one close range blade and one shooting weapon each. Close range weapons consist of knives, swords, shields, and javelins, while shooting weapons consist of rifles, guns, launchers, and such. Armour can be equipped to your head, torso, arms and legs. Using specific equipment from certain manufacturers counts as advertising in this game, which can help build official support that sees newer and better equipment from that manufacturer produced. Equipment also has slots, which can be filled with items that buff your skills and Arts. Your character strength is represented by your Inner Level and Class Rank progression. Inner Level ties into which equipment you are able to equip, rising in combat and through the discovery of treasure out in the field. Class Rank governs your battle style, with players building up to a specialist class that uses specific Arts and weapons in order to refine their style. Up to four Blade Members can team up for exploration. Sounds intriguing. And massively life-consuming then. Tell my family, that I love them dearly in case they never see me again, or wonder who the dirtier than usual bearded hobo is that’s staring at the screen in my room while a Japanese soundtrack plays.